The stars will be out for the Nortel Networks Palm Springs International Film Festival — the place to see foreign films submitted for Academy Award consideration. 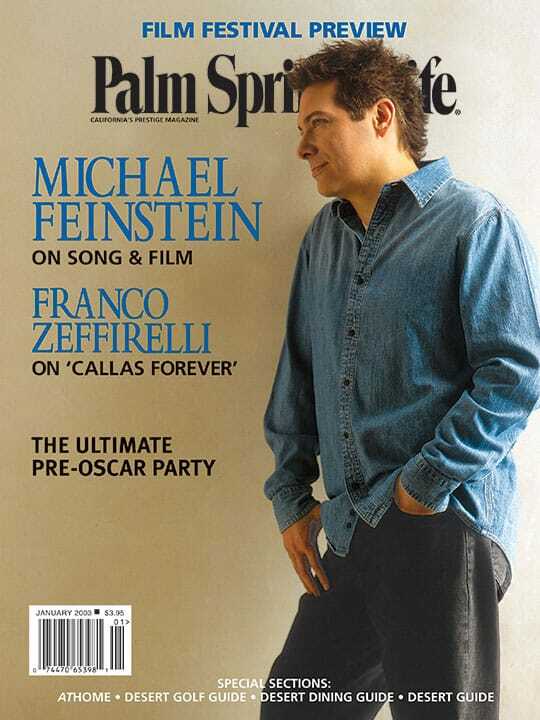 Michael Feinstein on Gershwin, Palm Springs and the film American Songbook. From Sleepy Hollow to Chicago, Colleen Atwood creates striking costumes for thrilling characters. On the eve of his lifetime achievement award, Franco Zeffirelli refuses to rest on his laurels. California’s energy crisis jolted businesses throughout the state, including the Coachella Valley. But PSL found these fine examples of energy efficiency in the desert. Sound and vision: What’s in store for the family room in the 21st century? Make room: Here comes dessert! Plus: The desert’s finest restaurants.